No one’s more invested in protecting their privacy than kids and teens who don’t want siblings or parents snooping around their bedrooms. 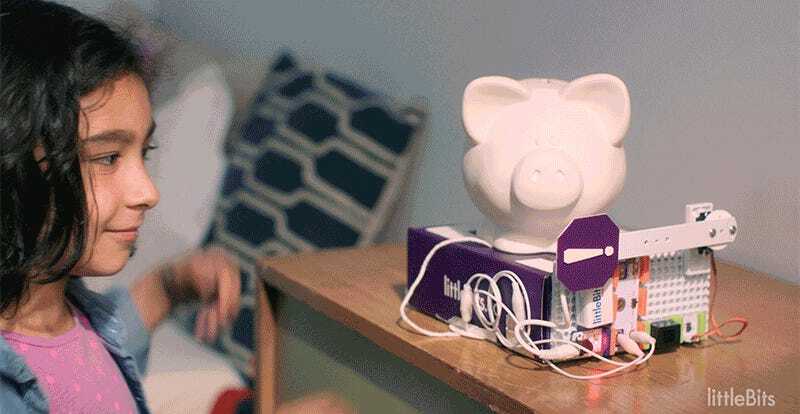 So littleBits new “Rule Your Room Kit” includes eight different touch-activated gadgets that kids can build themselves, without requiring an electrical engineering degree, to help secure their rooms. The kit is the first littleBits set that includes the recently introduced Makey Makey Bit, making it easy to add touch sensitive controls to a custom creation. Anything that conducts electricity, like a piece of fruit, aluminum foil, or even people, can be used as a trigger. The Makey Makey Bit joins six other electronic components in the kit, including a sound trigger, a servo, and an audible buzzer that can be used to set up booby traps, or alarms, to let kids know when someone has invaded their space. Step-by-step instructions for eight different projects are included in the $99 kit, letting kids build everything from a weight-triggered buzzer for protecting a piggy bank to a catapult that launches projectiles when an intruder is detected. The included components can also be used to build hundreds of other projects available online, so kids aren’t limited to just setting up boobytraps or messing with siblings—not that they wouldn’t thoroughly enjoy either pastime.